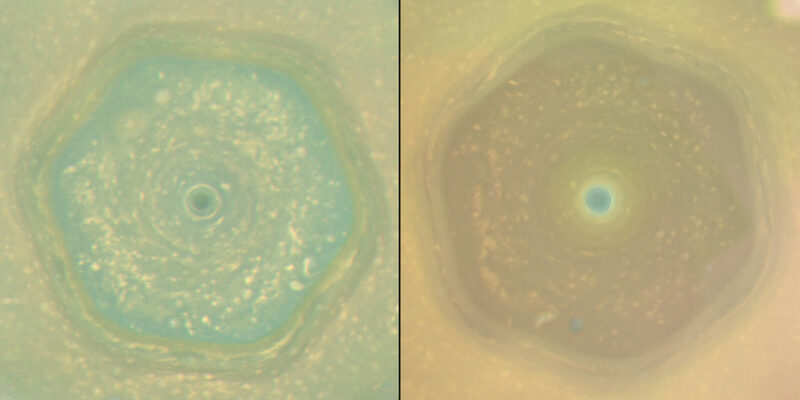 These natural color views from Cassini show how the color of Saturn’s north-polar region changed between June 2013 and April 2017, as the northern hemisphere headed toward summer solstice. Image credit: NASA/JPL-Caltech/SSI/Hampton Univ. May 24, 2017 – NASA’s Cassini spacecraft still has a few months to go before it completes its mission in September, but the veteran Saturn explorer reaches a new milestone today. Saturn’s solstice — that is, the longest day of summer in the northern hemisphere and the shortest day of winter in the southern hemisphere — arrives today for the planet and its moons. The Saturnian solstice occurs about every 15 Earth years as the planet and its entourage slowly orbit the sun, with the north and south hemispheres alternating their roles as the summer and winter poles. Reaching the solstice, and observing seasonal changes in the Saturn system along the way, was a primary goal of Cassini’s Solstice Mission — the name of Cassini’s second extended mission. Cassini arrived at Saturn in 2004 for its four-year primary mission to study Saturn and its rings and moons. Cassini’s first extended mission, from 2008 to 2010, was known as the Equinox Mission. During that phase of the mission, Cassini watched as sunlight struck Saturn’s rings edge-on, casting shadows that revealed dramatic new ring structures. NASA chose to grant the spacecraft an additional seven-year tour, the Solstice Mission, which began in 2010. 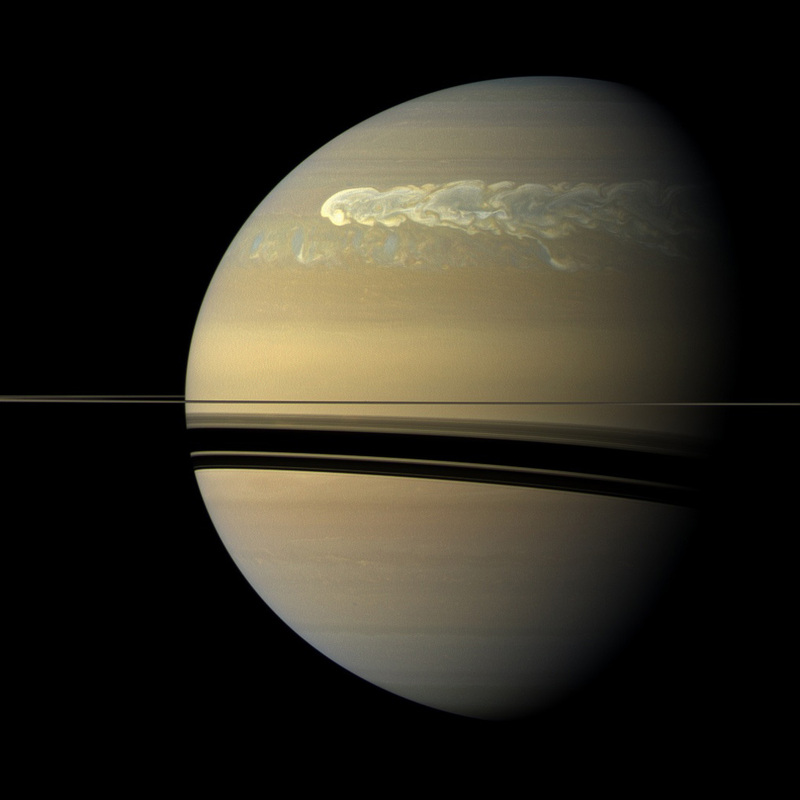 During its Solstice Mission, Cassini watched a giant storm erupt and encircle the planet. The spacecraft also saw the disappearance of bluer hues that had lingered in the far north as springtime hazes began to form there. The hazes are part of the reason why features in Saturn’s atmosphere are more muted in their appearance than those on Jupiter. Data from the mission showed how the formation of Saturn’s hazes is related to the seasonally changing temperatures and chemical composition of Saturn’s upper atmosphere. Cassini researchers have found that some of the trace hydrocarbon compounds there — gases like ethane, propane and acetylene — react more quickly than others to the changing amount of sunlight over the course of Saturn’s year. 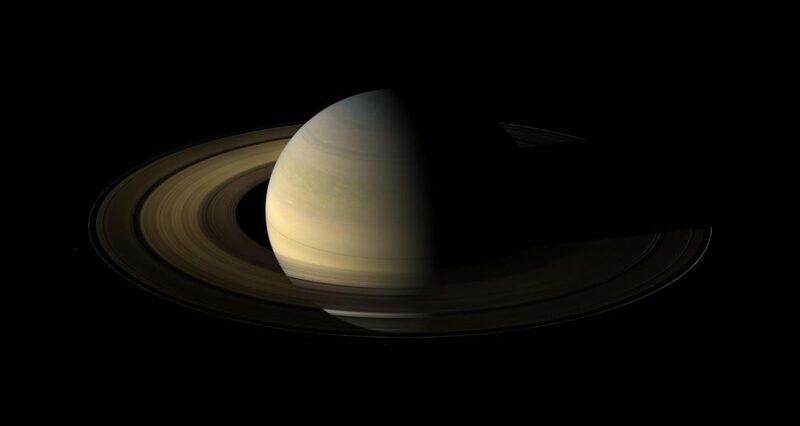 Researchers were also surprised that the changes Cassini observed on Saturn didn’t occur gradually. They saw changes occur suddenly, at specific latitudes in Saturn’s banded atmosphere. “Eventually a whole hemisphere undergoes change, but it gets there by these jumps at specific latitude bands at different times in the season,” said Robert West, a Cassini imaging team member at JPL. Following equinox and continuing toward northern summer solstice, the sun rose ever higher above the rings’ northern face. And as the sun rises higher, its light penetrates deeper into the rings, heating them to the warmest temperatures seen there during the mission. The solstice sunlight helps reveal to Cassini’s instruments how particles clump together and whether the particles buried in the middle of the ring plane have a different composition or structure than the ones in the rings’ outer layers. Saturn’s changing angle with respect to the sun also means the rings are tipped toward Earth by their maximum amount at solstice. In this geometry, Cassini’s radio signal passes more easily and cleanly through the densest rings, providing even higher-quality data about the ring particles there. Cassini has watched Saturn’s largest moon, Titan, change with the seasons, with occasional dramatic outbursts of cloud activity. After observing methane storm clouds around Titan’s south pole in 2004, Cassini watched giant storms transition to Titan’s equator in 2010. Although a few northern clouds have begun to appear, scientists have since been surprised at how long it has taken for cloud activity to shift to the northern hemisphere, defying climate models that had predicted such activity should have started several years earlier. 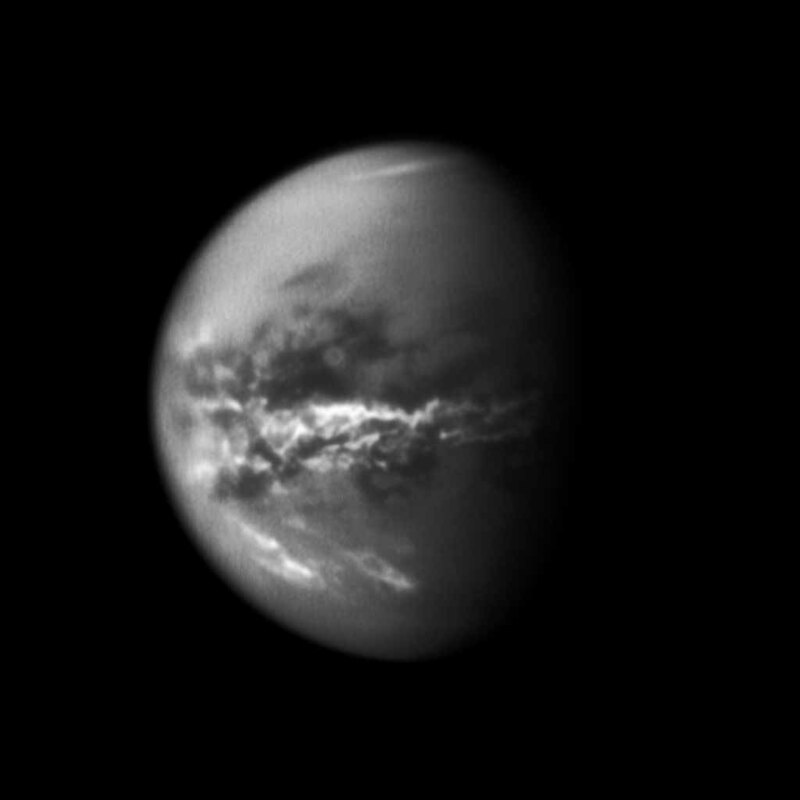 “Observations of how the locations of cloud activity change and how long such changes take give us important information about the workings of Titan’s atmosphere and also its surface, as rainfall and wind patterns change with the seasons too,” said Elizabeth Turtle, a Cassini imaging team associate at the Johns Hopkins University Applied Physics Laboratory in Laurel, Maryland. In 2013, Cassini observed a sudden and rapid buildup of haze and trace hydrocarbons in the south that were previously observed only in Titan’s high north. This indicated to scientists that a seasonal reversal was underway, in which Titan’s main atmospheric circulation changes direction. This circulation was apparently channeling fresh hydrocarbon chemicals from closer to the equator toward the south pole, where they were safe from destruction by sunlight as that pole moved deeper into winter shadow. For Enceladus, the most important seasonal change was the onset of winter darkness in the south. Although it meant Cassini could no longer take sunlit images of the geologically active surface, the spacecraft could more clearly observe the heat coming from within Enceladus itself. With the icy moon’s south pole in shadow, Cassini scientists have been able to monitor the temperature of the terrain there without concern for the sun’s influence. These observations are helping researchers to better understand the global ocean that lies beneath the surface. From the moon’s south polar region, that hidden ocean sprays a towering plume of ice and vapor into space that Cassini has directly sampled. As Saturn’s solstice arrives, Cassini is currently in the final phase of its long mission, called its Grand Finale. Over the course of 22 weeks from April 26 to September 15, the spacecraft is making a series of dramatic dives between the planet and its icy rings. The mission is returning new insights about the interior of the planet and the origins of the rings, along with images from closer to Saturn than ever before. The mission will end with a final plunge into Saturn’s atmosphere on September 15. The Cassini-Huygens mission is a cooperative project of NASA, ESA (European Space Agency) and the Italian Space Agency. NASA’s Jet Propulsion Laboratory, a division of Caltech in Pasadena, California, manages the mission for NASA’s Science Mission Directorate, Washington. JPL designed, developed and assembled the Cassini orbiter.The Cassini imaging operations center is based at Space Science Institute in Boulder, Colorado.